Define rectangular regions of interest (ROI) labels, polyline ROI labels, pixel ROI labels, and scene labels, and use these labels to interactively label your ground truth data. Use built-in detection or tracking algorithms to label your ground truth data. Write, import, and use your own custom automation algorithm to automatically label ground truth. See Create Automation Algorithm for Labeling (Computer Vision Toolbox). Evaluate the performance of your label automation algorithms using a visual summary. See View Summary of Ground Truth Labels (Computer Vision Toolbox). Export the labeled ground truth as a groundTruth object. You can use this object for system verification or for training an object detector or semantic segmentation network. 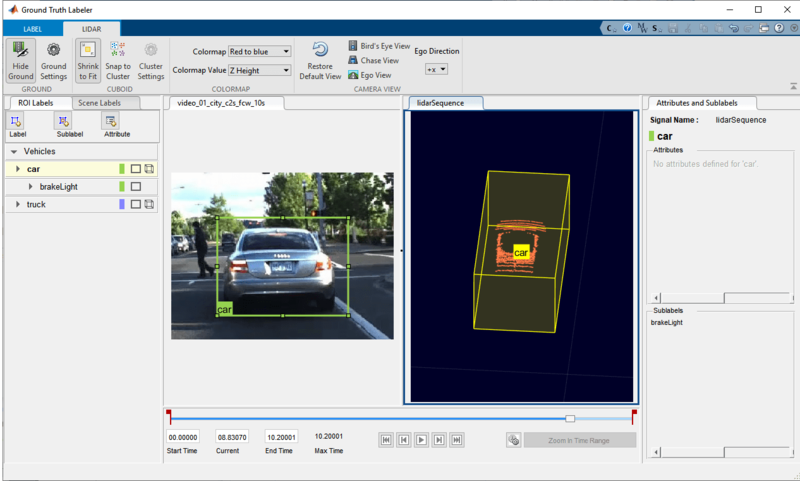 See Train Object Detector or Semantic Segmentation Network from Ground Truth Data (Computer Vision Toolbox). Display time-synchronized signals, such as lidar or CAN bus data, using the driving.connector.Connector API. To learn more about this app, see Get Started with the Ground Truth Labeler. 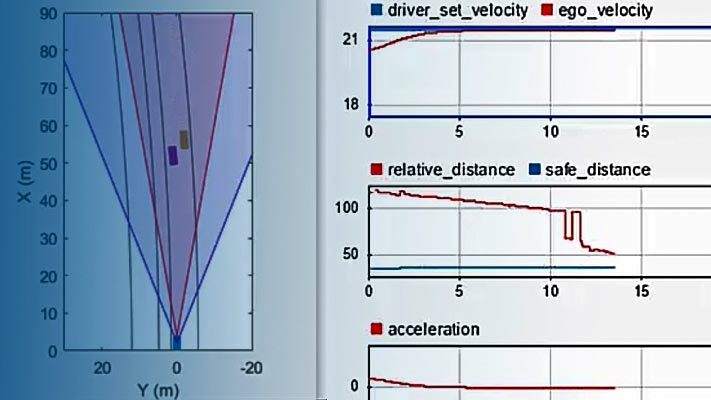 MATLAB® Toolstrip: On the Apps tab, under Automotive, click the app icon. MATLAB command prompt: Enter groundTruthLabeler. groundTruthLabeler opens a new session of the app, enabling you to label ground truth data. groundTruthLabeler(videoFileName) opens the app and loads the input video. The video file must have an extension supported by VideoReader. groundTruthLabeler(imageSeqFolder) opens the app and loads the image sequence from the input folder. An image sequence is an ordered set of images that resemble a video. The images must be the same size. imageSeqFolder must be a string scalar or character vector that specifies the folder containing the image files. The image files must have extensions supported by imformats and are loaded in the order returned by the dir function. To label a collection of unordered images that can vary in size, use the Image Labeler app instead. groundTruthLabeler(imageSeqFolder,timestamps) opens the app and loads a sequence of images with their corresponding timestamps. timestamps must be a duration vector of the same length as the number of images in the sequence. For example, load a sequence of road images and their corresponding timestamps into the app. groundTruthLabeler(gtSource) opens the app and loads the groundTruthDataSource object, gtSource. The object contains a custom data source and corresponding timestamps. See Use Custom Data Source Reader for Ground Truth Labeling (Computer Vision Toolbox). groundTruthLabeler(sessionFile) opens the app and loads a saved app session, sessionFile. The sessionFile input contains the path and file name. The MAT-file that sessionFile points to contains the saved session. groundTruthLabeler(___,'ConnectorTargetHandle','connector') opens the app with a custom connector. 'connector' is a handle to a driving.connector.Connector class. The handle implements a custom analysis or visualization tool that is time-synchronized with the Ground Truth Labeler app. For example, to associate a connector target defined in class MyConnectorClass, specify @MyConnectorClass. For example, open the app, load a 10-second video into it, and open a lidar visualization tool that is time-synchronized to the video. The built-in automation algorithms support the automation of rectangular ROI labels only. When you select a built-in algorithm and click Automate, scene labels, pixel labels, polyline labels, sublabels, and attributes are not imported into the automation session. To automate the labeling of these features, create a custom automation algorithm. See Create Automation Algorithm for Labeling (Computer Vision Toolbox). Pixel ROI labels do not support sublabels or attributes. To avoid having to relabel ground truth with new labels, organize the labeling scheme you want to use before marking your ground truth. The Ground Truth Labeler app provides built-in algorithms that you can use to automate labeling. From the app toolstrip, click Select Algorithm, and then select an automation algorithm. Detect and label people using a pretrained detector based on aggregate channel features (ACF). With this algorithm, you do not need to draw any ROI labels. Track and label one or more rectangular ROI labels over short intervals using the Kanade-Lucas-Tomasi (KLT) algorithm. Estimate ROIs in intermediate frames using the interpolation of rectangular ROIs in key frames. Draw ROIs on a minimum of two frames (at the beginning and at the end of the interval). The interpolation algorithm estimates the ROIs between the frames. Detect and label vehicles using a pretrained detector based on ACF. With this algorithm, you do not need to draw any ROI labels.